The Expanded Options (EO) program allows eligible juniors and seniors in Oregon high schools to take college credits classes at Columbia Gorge Community College (CGCC) or online. In most cases, your high school will cover the cost of tuition and fees for these courses, but check with your high school counselor to confirm. Contact your high school for the EO program eligibility requirements and program application. Initial eligibility for EO program is decided in the spring, prior to the students' Junior and/or Senior years in high school. Some college classes do not have prerequisites. Check with a CGCC advisor about classes you can take without the Placement Assessment. Submit EO program application to your high school. 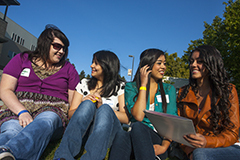 Apply to Columbia Gorge Community College (CGCC), and take the Placement Assessment (study guides). Meet with your high school counselor to determine which courses will meet your high school graduation requirements. Meet with a CGCC Academic Advisor to discuss college goals and create an educational plan.